KJIPUKTUK (Halifax) – Finally, we have almost made it to the middle of the pack. Yay! This week’s minimum wage hike in Nova Scotia from $11.05 to $11.55 an hour means there are three provinces with a lower minimum wage than ours – but they are quickly catching up. Saskatchewan (at $11.06), Manitoba (at $11.35) and Newfoundland and Labrador (at 11.40) fly below our radar. However PEI, at $12.25 an hour, is the highest in the Atlantic region and 6% higher than in NS. In Nova Scotia, if you work 40 hours a week at minimum wage you earn $462 a week, or just over $24,000 a year. 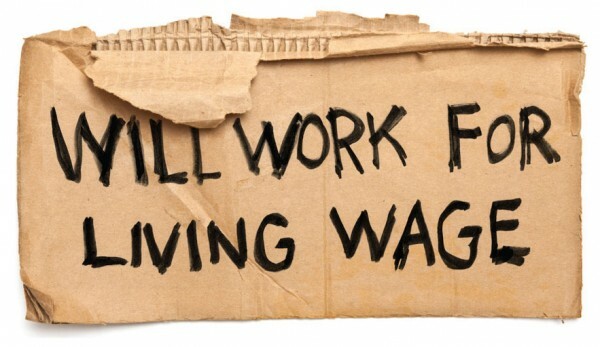 However to earn minimum wage of $11.55, you have to have worked for the same employer for at least three months. If you have not worked the requisite three months for the same employer, you will earn the “inexperienced” wage of $11.05 an hour. An employer can pay any new employee (who is not in a union) 50 cents below minimum wage or $11.05 for the first three months. For a 40 hours’ work, an “inexperienced” employee earns only $442 a week – a 4.3% cut from minimum wage! The Living Wage Campaign, supported by the Canadian Centre for Policy Alternatives-NS, calculated the Living Wage in Halifax in 2016 at $19.17 an hour. This means two adults in a family must each earn at least $19.17 an hour for a 35 -40 hour work week for a household to meet its basic needs. What are basic needs? The Living Wage calculation is based on a family with two wage earners and two children under age 12. The household may own a modest family car, use a bus pass, pay for daycare and after-school care, buy groceries and pay rent and utilities. The Living Wage also includes money to buy clothing, pay for medical expenses, cover ‘social inclusion’ – such as swimming lessons, or going to occasional movies– and ensure a family is not under severe stress due to lack of money. Nova Scotia’s minimum wage is 39.7% lower than Halifax’s Living Wage. In 2016, 6.6% of employees in Nova Scotia earned minimum wage ($10.70/hr at the time). 32% or 125,200 of all NS workers earned $15 an hour or less. Oh –the bright spot on the horizon: Indeed recently posted an ad for President of NSCAD University. True it’s a “killer” 48 hour week, but the job does pay $231,000 per year. Judy Haiven is on the steering committee of Equity Watch, a Halifax-based organization which fights bullying, racism and discrimination in the workplace.